This article is no longer being updated. For the latest on the Holy Fire, click here. An 18,100-acre wildfire allegedly set by an arsonist has forced the evacuation of more than 7,400 homes and destroyed about a dozen buildings as it rampaged through dry brush and into a Riverside County neighborhood. Gov. 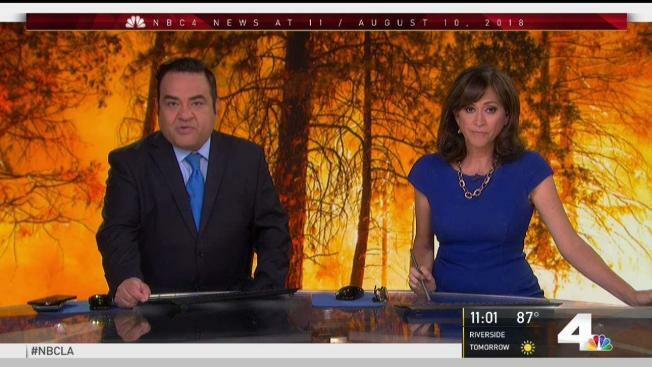 Jerry Brown has declared a state of emergency for Riverside and Orange counties as the Holy Fire has blackened 10,236 acres of the Cleveland National Forest and was only 5 percent contained. It forced the evacuation of more than 7,400 homes totaling about 21,400 people. The fire burned about 10,200 acres by Thursday, spreading to an estimated 18,100 acres Friday morning. Overnight flare-ups cast embers into decades-old dry brush, sparking spot fires that kept firefighters on the move and residents on the lookout. 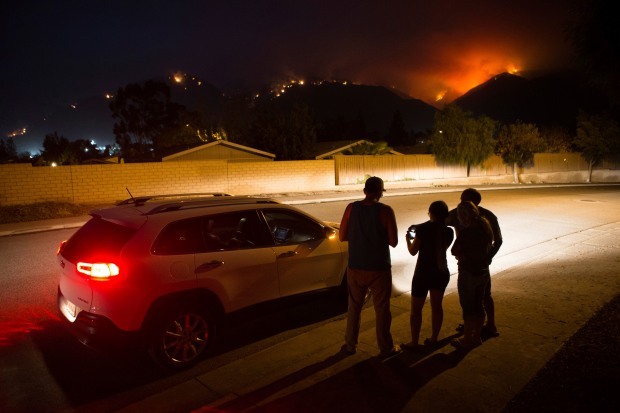 "It burned all the way across and I was up until about 5 this morning," said Lake Elsinore resident Fred Heldreth. "I slept for about an hour and a half, got up again and there's just still fire all over. The rocks are what saved it from burning all the way down. It would hit those rocks and stop." It is one of 13 large fires burning Friday in California, where more than 13,500 firefighters are on the front lines. The fires have scorched more than 671,000 acres and damaged or destroyed more than 2,000 buildings. About 3,300 residents remain evacuated statewide. Since it erupted Monday afternoon, the Holy fire has destroyed a dozen cabins in the Holy Jim Canyon area of the Cleveland National Forest and advanced into Riverside County. While the blaze continued its unrelenting march, U.S. Forest Service officials said Thursday they "expect favorable weather conditions this weekend" to help the firefighting effort. On Thursday afternoon, the flames raced downhill toward Lake Elsinore, threatening homes and prompting mandatory evacuation orders for homes fronting the mountains. As a roaring firefighting air tanker soared overhead, at least one resident used a garden hose in an effort to protect homes. "It's right there on the hill ... and there's active firefighting going on right now" to keep the flames from homes, said Thanh Nguyen of the Garden Grove Fire Department, who is one of the spokesman for the firefighting effort. What started as voluntary evacuations around 1:30 p.m. quickly escalated in 30 minutes to mandatory evacuations, Nguyen said. At their height, the flames appeared to be licking at the backs of homes closest to the mountains, but a series of precision drops of water and fire retardant successfully deflected the blaze, at least temporarily, and there were no immediate reports of homes being damaged in the area. A large swath of homes, however, was bathed fire retardant, creating the appearance of a bright red river cutting through the threatened neighborhood. Riverside County sheriff's deputies stepped up patrols in the evacuated areas to prevent looting, Nguyen said. The Holy Fire is being fed by thick, tinder-dry brush that hasn't burned in nearly four decades. The fire was reported about 1:15 p.m. Monday near Holy Jim Canyon and Trabuco Creek roads, Orange County Fire Authority Capt. Tony Bommarito said. The governor's emergency declaration means that state resources would be used to help with the blaze which has threatened thousands of homes, critical infrasctructure and has caused the evacuation of residents. The fire is believed to have been intentionally set and an arrest has been made. Forrest Gordon Clark was being held in lieu of $1 million bail. He faces charges of aggravated arson damaging at least five inhabited structures, arson of inhabited property, arson of forest and criminal threats, all felonies, as well as two misdemeanor counts of resisting arrest, according to Assistant District Attorney Chris Duff. Clark refused to leave his jail cell Thursday, delaying his scheduled arraignment until Friday, when it was once again pushed back. He is scheduled to be arraigned Aug. 17. The fire dramatically increased in size near the Horsethief Canyon area on Wednesday, then jumped the North Main Divide dirt road, burning into the Lake Elsinore area of Riverside County, Bommarito said. As the fire advanced into Riverside County, mandatory evacuation orders were issued for McVicker Canyon, Rice Canyon, Horsethief Canyon, Glen Eden, El Cariso Village, Sycamore Creek and Rancho Capistrano, along with the Ortega (74) Highway corridor from the Lookout restaurant to the Nichols Institute. Weather conditions with temperatures exceeding 100 degrees and relative humidity below 15 percent created conditions conducive to extreme fire behavior as well as heat illnesses for the firefighters, according to the U.S. Forest Service. The South Coast Air Quality Management District issued a smoke advisory through Friday in Orange County and portions of Los Angeles, Riverside and San Bernardino counties because of the Holy fire. In Los Angeles, the advisory covers the east and south San Gabriel Valley and Pomona/Walnut Valley.